A milky sky, a cold wind, and the chaffinches going crazy in the trees around Castleton. 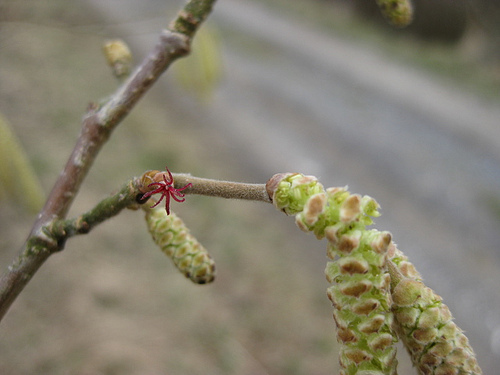 Maybe it was the promise of a long-delayed spring implicit in the tender leaf buds sprouting at the tip of every twig, or perhaps they were just getting their mating chops together. Whatever about the birds, the nip of the wind and the scud of the sky had Jane and me stepping out sharply enough as the church clock chimed half past eleven. 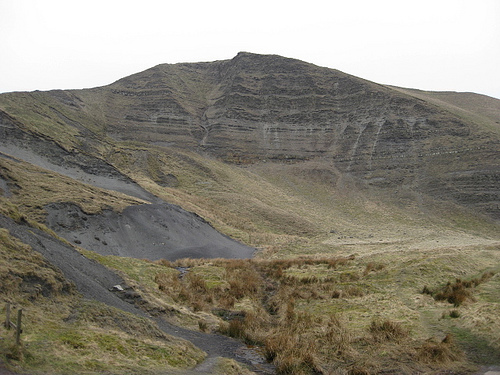 Castleton lies cradled in a natural amphitheatre of hills whose rocks are seamed with rich deposits of lead. 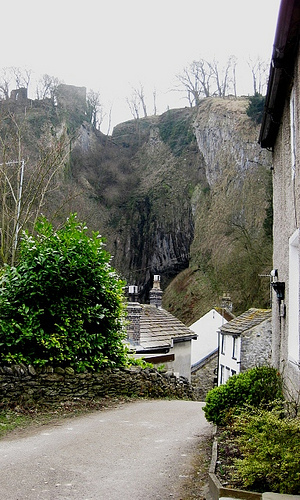 The mineral was mined from a series of caverns along the line of the hills – Peak, Speedwell, Treak Cliff and Blue John itself, its name derived from the beautiful pale purple bluejohn stone so popular with jewellery makers and ornamental carvers. This early in the year there were few visitors in the show caves and bluejohn shops. Most folk moving in the hills around Castleton today were walkers like ourselves, only too delighted to be stretching the winter slackness away. Below the rocky gorge of Winnats we looked back across fellsides striped with dark stone walls and dotted with small stone barns, to see the black ruin of Peveril Castle perched like a raven on its crag above the huddled houses of Castleton. In the chill dark mouth of Peak Cavern below the stronghold once squatted a whole tribe of rope-spinners, their lungs and joints sacrificed to the dampness they needed to tease the fibres together. Lead miners lived and died in even worse case. What desperate conditions our ancestors put up with, just because they had to. 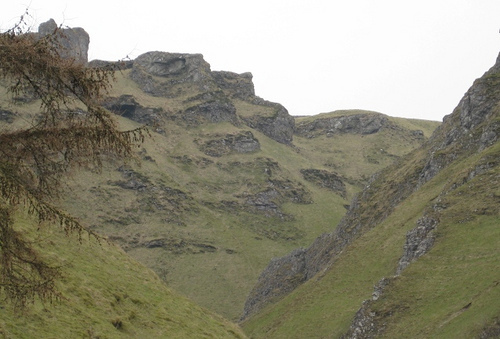 We crossed the bumpy old mine-spoil ground with its velvety nap below the striated cliff of Mam Tor, and went crabwise up the long slope to Hollins Cross on the ridge, where ant-like figures were striding. Up there the wind blew at double strength, smacking and shoving us along the flagged pathway towards the big dark cliff of Back Tor. Here with a Kit Kat apiece we snuggled down in the lee of a handy peat hag for a few minutes, and took in the view north up the long valley of the River Noe. Edale village was a scatter of toy houses far below, and the old purgatorial start of the Pennine Way up Grindsbrook Clough cut a deep dark scar into the fellside. A step more along the ridge to the summit point of Lose Hill, and we were looking down on the whole glorious length of the Castleton valley – our forward view for the homeward path. Rail: (www.thetrainline.com; www.railcard.co.uk) to Hope (2 miles); buses (www.derbysbus.info/times) from Bakewell, Matlock, Sheffield. Road: From A57 at Ladybower Reservoir – A6013, A6187. Cross road; up lane by 3 Roofs Café. At road, right (148828); uphill (‘Speedwell Cavern’), then field path to cross road at Speedwell Cavern (140827). Left-hand path (yellow arrows) above Treak Cliff Cavern (136831) to Blue John Cavern (132832). 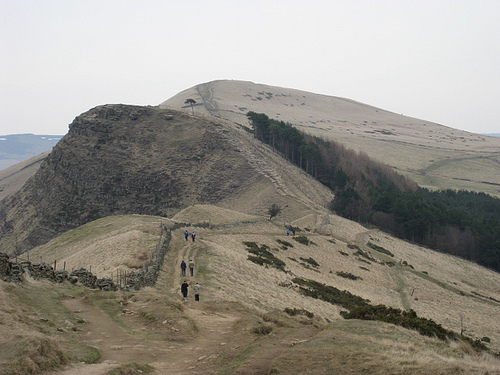 Right to road; right to car park; across waste ground under Mam Tor Cliff to Mam Farm (133840); up hillside to Hollins Cross (136845); ridge to Back Tor and Lose Hill (153854). Paved path down to cross stile (155851); bear right for 100 yards to cross another stile; left along fence, then downhill through trees (157848). In 30 yards, just before fingerpost, right downhill to bypass Losehill Farm. Lane downhill to Spring House Farm. Just past house, right along lane (156840, ‘Castleton’ fingerpost) past Losehill Hall. Where drive swings left, keep ahead through wicket gate (152838). Ahead across fields, then along lane to road (148835). Ahead into Castleton. NB – Detailed directions, online maps, more walks: www.christophersomerville.co.uk. More Info: Castleton Visitor Information Centre (01629-816572; www.peakdistrict.gov.uk); www.peak-experience.org.uk; www.ramblers.org.uk. 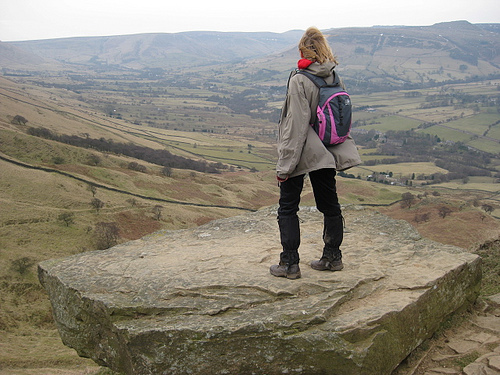 My wife cut out the Good Walk for Castleton and Lose Hill in May, and we walked it last week. What a fantastic area! We did not know it at all, but will certainly return there. Our only real problem came in the section after Treak Cliff Cavern, where we found ourselves on a steep hillside with no clear way out. We dropped down to the end of the road where the buses turn, and were OK from there on, climbing up to Black Tor, where we were approached by the most inquisitive sheep I have ever known when we sat down for lunch. Should we have climbed up above the entrance to Treak Cliff Cavern, or did we simply miss the path along the side of the hill? I’m so glad you enjoyed the walk. I think you may have omitted to download the detailed instructions from my website, as recommended in the article at the end of the Walk Directions. I only get 600 words to tell the story and give all the practical information, and for many of the walks that’s not enough. So if the actual ‘turn left, turn right’ directions are too long to fit in, as in this case, I point readers to a fuller version (‘detailed directions’) on my website. It’s not really ideal, because it’s easy to miss that little phrase on the close-printed page, but it’s the best I can do in the circumstances! From the road at the foot of Winnats there are two paths; the left-hand path, waymarked with yellow arrows, goes along the hillside, passes above the buildings of Treak Cavern, and bears left-handed up the hillside (yellow arrows) to reach the road opposite Blue John Cavern. I can’t find detailed instructions anywhere!! Can I have a direct link? I hope this helps. Christopher may say more on the directions. Here are the detailed instructions in full – hope you enjoy the walk! Rail: (www.thetrainline.com; http://www.railcard.co.uk) to Hope (2 miles); buses (www.derbysbus.info/times) from Bakewell, Matlock, Sheffield. 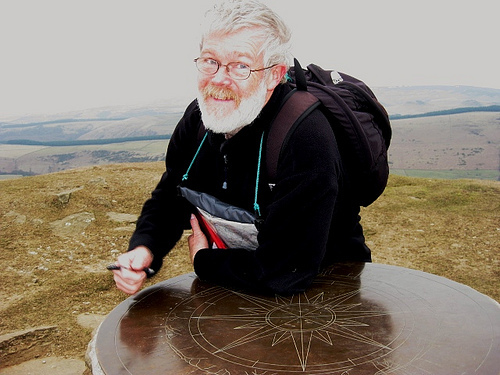 NB – Online maps, more walks: http://www.christophersomerville.co.uk. More Info: Castleton Visitor Information Centre (01629-816572; http://www.peakdistrict.gov.uk); http://www.peak-experience.org.uk; http://www.ramblers.org.uk.